On Day 2 at the Steiner Institute, we talked about winter festivals, starting with advent. While the teacher was talking about the winter festivals and ideas, projects, verses and songs that go with the winter season, some of finished our Prince Autumn dolls. I also added a pumpkin to stand with mine. Our teacher had some wonderful nature tables set up around the room for advent and winter. She showed us how to make transparency windows that you can use on the nature table or a larger version to cover one of your own windows as winter moves into the season of darkness. She had some wonderful Saint Nicholas dolls, and we discussed St. Nicholas Day with it's traditional shoe goodies for a bit. 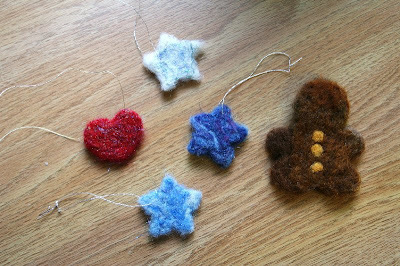 With advent, we discussed special ways to celebrate, such as a bell appearing on a branch of the nature table each day, or a new needlefelted star appearing somewhere in the house (or on a grapevine wreath) each day. 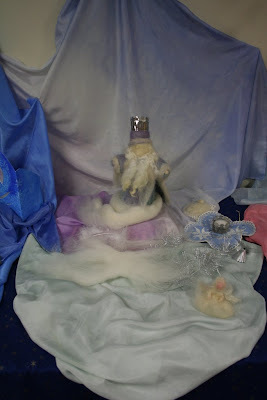 We also discussed the nativity and baby Jesus appearing or Madonna and child appearing at the end of advent. 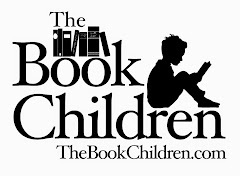 We, of course, discussed King Winter and Mrs. Thaw, which aren't really as appropriate for where I live since thaw happens about 3 hours after a snow. Although you could certainly do them to represent cold weather rather than snow. I really liked the use of the brown silk under the white that Mrs. Thaw is sweeping, since in the Northeast, thaw is followed by mud season. 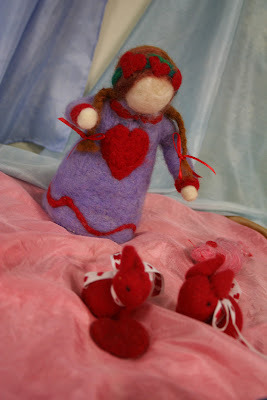 We also talked about Valentine's Day and some ways to keep that holiday sweet, including cookie-cutter felted hearts. 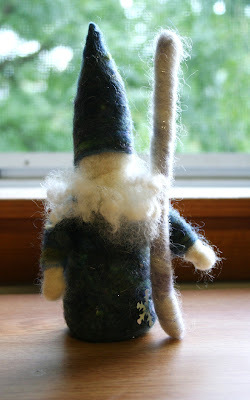 You simply place a cookie cutter on your felting sponge, place wool inside the cutter and go to work. 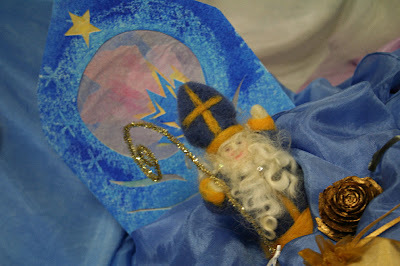 It's fun, quick work and can make nice ornaments for your children to give as gifts. The teacher let us get creative and decide what kind of winter project we wished to work on today. After talking to the kids on the phone last night, I decided to make Jack Frost, at their request. Paul said that the first thing Philip asked when he picked him up from the Y this evening was if I had made Jack Frost. :) So here's Jack Frost! He carries an ice wand to leave frost crystals on the grass. The lighting's not the best and I have NO photo-editing software with me so you can't see the dark blue color variants on his clothes and hat, which include some glitter. We're fortunate to have a vast array of wool to work with, and I'm taking advantage of that! 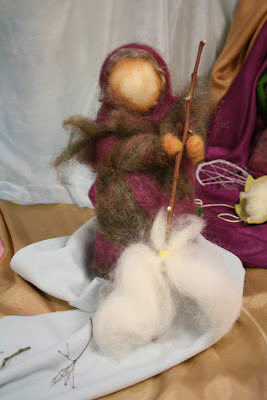 Tomorrow is spring, and we've discussed making a Lady Spring or wet-felting a spring scene. I'll keep you posted! This is fascinating. 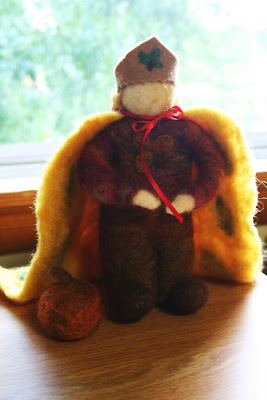 I'm realizing how very little I actually know about Waldorf education-- promise to fill me in when you get back! ack! i soooooooooo want to be there!! i love everything you are creating and learning. thank you thank you again for sharing! im obsessed with winter/solstice/advent/christmas lately. i think b/c of the ornaments i'm working on. Joy, thanks for sharing all of this! These nature tables put my nature tables to shame. You're making me want to felt!!! 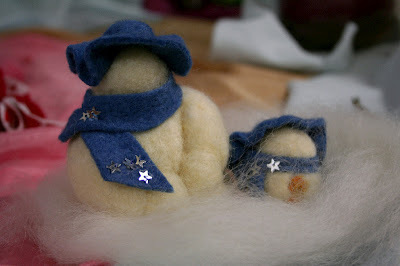 Thanks for sharing the beautiful needle felting. 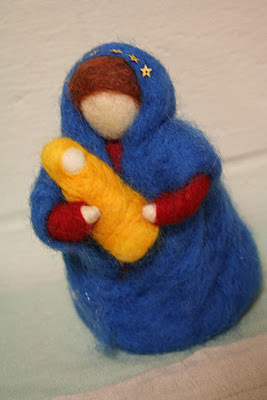 Your felting looks gorgeous Joy! Thanks so much for sharing this!!! Are you enjoying the workshop--would you reccommend it? I would just love to attend a workshop like this. 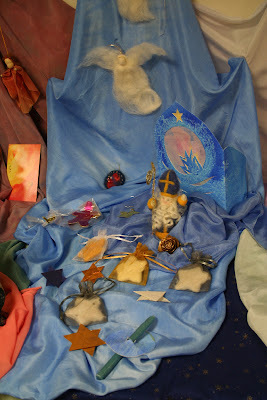 I have attended a Story telling workshop at our local Waldorf school. It was wonderful sitting amoungst other like minded mothers gathering inspiration to take home. 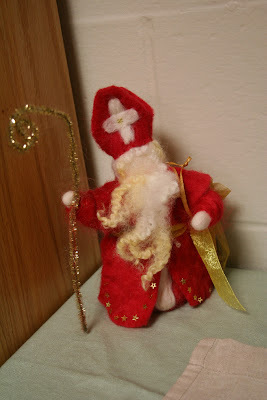 I love all the felting that took place.